Johnny Depp Hintergrund - alice in wonderland Hintergrund. Johnny Depp Hintergrund - alice in wonderland Hintergrund. HD Wallpaper and background images in the Alice im Wunderland (2010) club tagged: johnny depp wallpaper alice in wonderland wallpaper. 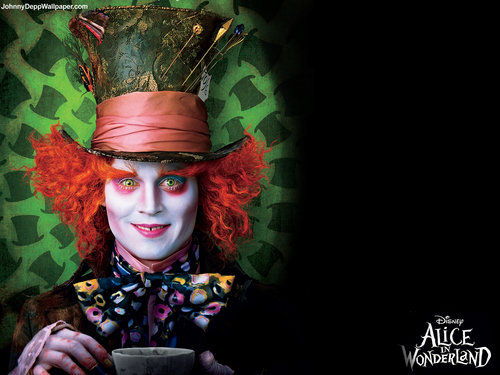 Love the movie and the mad hatter :) <3 ! I was scared by Mad Hatter's makeup at the first glance, but I turned loving him while I watching the film. :) “Why is a raven like a writing desk?"